Above image is based on a picture foundon the Binnenvaart site. Quite simple, it is blue with a thin white horizontal stripe in the middle above which is placed the name ‘rijkswaterstaat’ in lower case letters. Site of Rijkswaterstaat (restrictively translated as ‘government waterways authority’) is here, well-known as a department of the Dutch transport ministry and responsible for roads and waterways in the largest sense. As this includes the dykes, the importance of this body cannot be underestimated. In all, Rijkswaterstaat has about 10.000 employees. Since 1 January 2006 it is a government agency with a view to heightening efficiency. 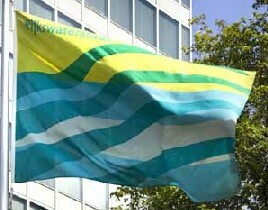 The current Rijkswaterstaat rectangular flag is a stripy affair. See here under “19 januari 2007” (photo is clickable). Almost hidden is the name of the service! A strikingly modern flag, typical of the design conscious Dutch, was in use for a number of years. Basically on a yellow-blue-white-blue horizontally divided field it bore four ascending “waves” which were blue but turned into green, it seems, on reaching the yellow stripe. For good measure, the office’s name was added in the top hoist: “Rijkswaterstaat” in green. Photo of a rectangular flag (there was a pennant as well). In context (see 28 Aug 2009, third post – the flag is said to have been first hoisted “this week”): apparently vertically divided 1:2 white and light blue, respectively, a dark blue narrow rectangle descends from the top of the white stripe – not quite reaching the bottom – bearing the Dutch arms in white. Dark blue rectangle with arms in evidence on the official site: house style page (downloads), stating that the former style - and that of dozens of others - will completely have been superseded by the national one end 2010, and details. In addition I can report that all emblems and flags of the various government departments (ministries), services etc. will disappear. Every part of the Netherlands government will have as its emblem the national coat of arms in white with a supporting blue colour (there are five shades of blue). This is to bring unity to the government and make it clear to the people and companies that they are dealing with a part of the national government and not with encyclopaedia-salesmen. There was a big row when this emblem was presented on 21 December 2007. It was the same as the Department of General Affairs (the prime minister's department) already had, but with inverted colours. The designer, Dumbar, presented their own design from 2002 again in 2007. The total project costs 18 million euro. The new emblem will be used on flags, letter paper, printed matter, and on the outside of government buildings. All information can be found here. This includes several factsheets and information on all colours that can be used. Also there are videos. Everything is in Dutch, but a lot speaks for itself.